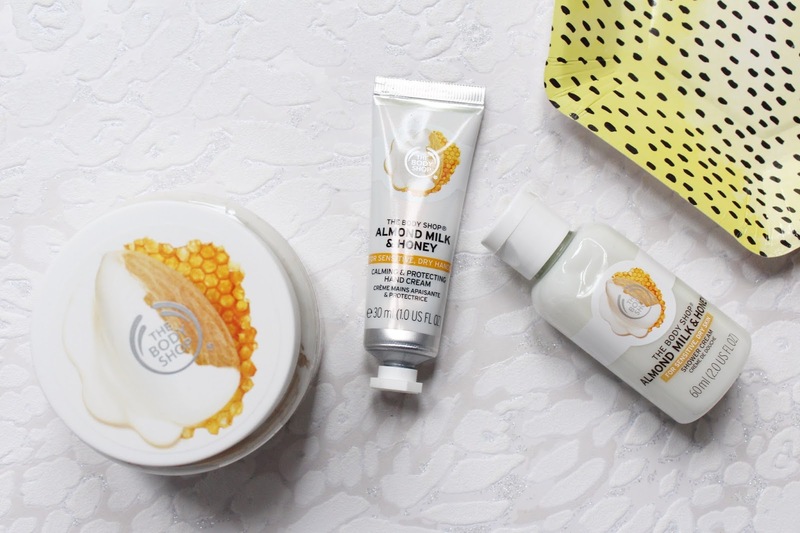 I have been a long time fan of products from The Body Shop and as soon as these three products arrived, I fell in love with the scent. You can never go wrong with body products from The Body Shop and they almost always have an amazing discount code so you can save money too! 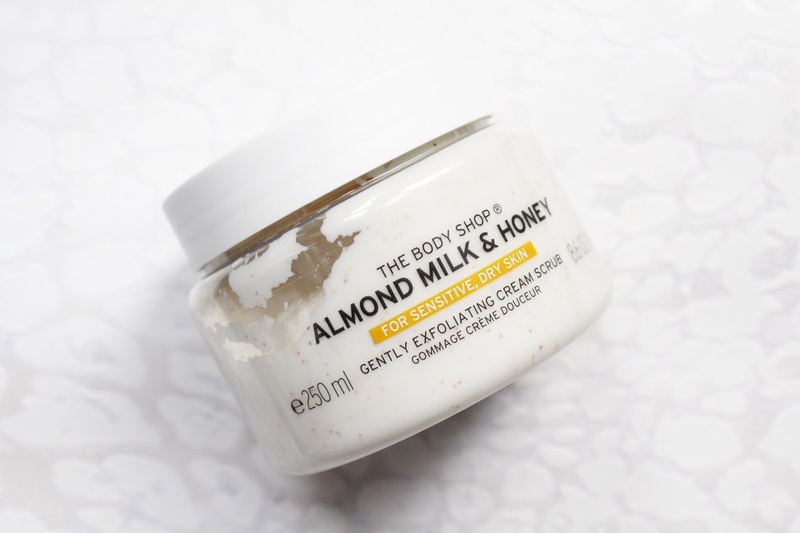 The Almond Milk & Honey range from The Body Shop has been specifically designed for those with sensitive and dry skin. All these of these products are incredibly nourishing on the skin and have a light yet delicious scent which is hypoallergenic. Each of these three products has been made with organic almond milk enriched with Trade honey and organic almond oil. I have three products from the range, a Shower Cream, Hand Cream and a Gentle Exfoliating Cream Scrub but there is also products such as the Body Butter and the Bath Milk which I can't wait to try next! The Soothing & Caring Shower Cream has been a real delight to use in the mornings. This has been formulated to be soap free and will respect your skin's natural moisture barrier and pH. This is available in two sizes, 60ml for £2 and 250ml for £5, I have the smaller size and it will be perfect for any upcoming holidays! This is so gentle on the skin but leaves the skin feeling clean and refreshed yet soothed and moisturised, it is unlike any other shower gel I have used before. I had a couple of dry and uncomfortable patches on my arms and this really helped calm them down and add some much-needed hydration back into these areas. I love exfoliating the skin but I find many are too harsh for my skin which is where the Gently Exfoliating Cream Scrub comes in. This retails for £15 for a 250ml tub and is going to delicately buff away dead skin cells to reveal softer and smoother skin. As this is a creamy scrub it is very gentle on the skin, as the name suggests but it is also moisturising while it buffs away the dead skin. The scrub itself is on the finer side and leaves the skin feeling super soft. I like to follow up with one of the Body Butters from The Body Shop after using this and my skin is left softer than ever before! I have had the driest hands and chuckles for almost a month now and no hand cream was cutting it but the Calming & Protecting Hand Cream has been amazing! This has been living in my handbag since it arrived and I can't get enough of it. This is very soothing on the skin and total bargain for just £4. Once applied to the hands it does take a few minutes to sink into the skin but it is so worth the wait as the skin is left feeling protected and calmed. It also leaves a hint of the scent on the skin which I love. 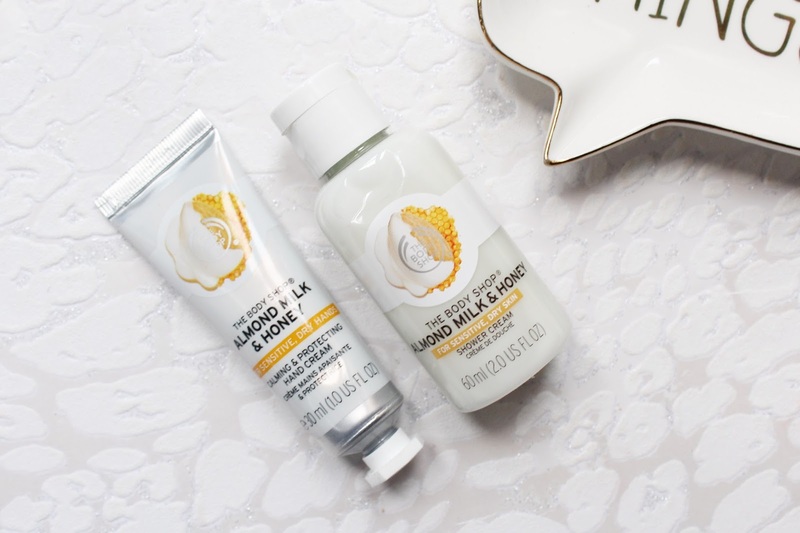 The Body Shop Almond Milk & Honey range is available - HERE.